Volkswagen has been praised for its decision to fit advanced emergency braking (AEB) systems as standard to all vans on sale in the UK – the Caddy, the Transporter and the new Crafter. The move resulted in the Crafter, which was put on sale earlier this year, having its insurance group rating reduced by up to four groups. Thatcham Research conducted independent crash tests on the Crafter at the end of July and recorded successful performance of the standard AEB systems at all speeds. As a result, the starting insurance group for the Crafter range is now 34. Thatcham has described AEB technology as "probably the most significant development in vehicle safety since the seat belt", adding that it has the potential to save more than 1,000 lives and prevent many more casualties over the next ten years. 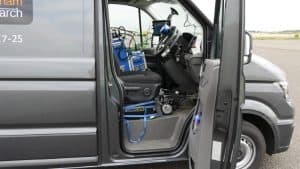 Peter Shaw, chief executive at the research centre, said these systems can help to stop the trend of year-on-year increases in deaths and serious injuries involving vans. He described Volkswagen as a "trailblazer" and said the manufacturer should be applauded for its decision to fit AEB as standard on all vans in the UK. Sarah Cox, head of marketing for Volkswagen Commercial Vehicles, said the company's decision to make this technology available as standard was driven by a desire to "keep drivers safe, vehicles on the road and reduce costs". In addition to the Caddy, Transporter and Crafter vans, the brand's range of larger vehicles includes the Caravelle passenger carrier, California camper and Amarok pick-up. Molly Benton, brand manager at Fuel Card Services, adds: "VW has made a big contribution to the commercial vehicles sector in the UK, and it's great to see that the addition of AEB systems to its vans is having such a positive impact on safety standards and insurance costs for fleet operators.